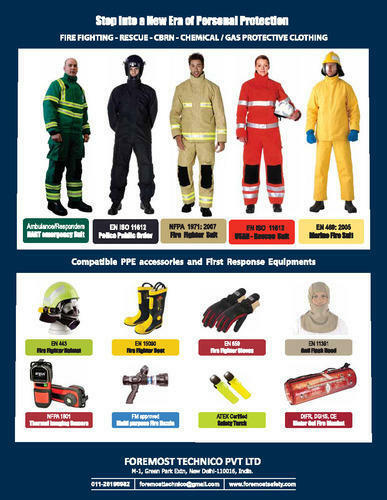 We are leading Importer and Master Distributor of Nomex fir suit, Water Jel Blankets, Fire Fighting Nozzle, Portable Water Monitor, Smoke Exhauster, Fire Helmet, Fire Fighter Boot, Fire Proximity Suit. Foremost offers a range of specialised equipments related to Fire Fighting, Rescue, Safety , Security and Damage Control Equipment. Our offered equipment and products find high utility in many prestigious areas such as Defence services, Oil Petroleum Sector, State Fire Services, Hotels- Commercial Establishments, Power plants and Industries.